Melanie St. John is a beautiful, smart, rich Texan daddy’s girl born to a bold, high-powered lawyer in the oil business who helps Melanie grow into someone who is both worldly and capable. But once she leaves college and enters the privileged world of dating highly sought-after “men of leisure,” she is catapulted in and out of the wealthiest places on the globe while hoping to get married and start a family with one of them. But these mostly destructive love affairs soon become a dynamic exploration of wealth and love, with all the highs and lows. And to complicate matters she is surrounded by her older, free-wheeling, wildcat sister (and her sister’s exotic but destructive best friend) as well as her own two completely opposite best friends, and each of them also hopes to find their own Prince Charming—which all only adds to the competition, adventures, and scandals. But throughout each relationship Melanie explores the deeper, more prevalent themes of family, friendship, love, intimacy, freedom, betrayal, motherhood, and most of all, inner strength. High Society, High Style, & High Drama! BIG, RICH, TEXAS: WHAT REALLY LIES BEHIND THE GLITTERING FAÇADE OF DEBUTANTE LIFE? ​Beautiful, bold, and born with a silver spoon firmly planted in hand, Melanie St. John is, by all outside accounts, the picture-perfect Texan Oil Princess. An independently wealthy daddy’s girl through and through, Melanie has spent her adult years flitting from one exotic, exclusive locale to another, being wooed by handsome, successful men, and in the dizzying center of dazzling, diamond-encrusted society life. ​But behind the glittering façade of her debutante life lays a very different story. 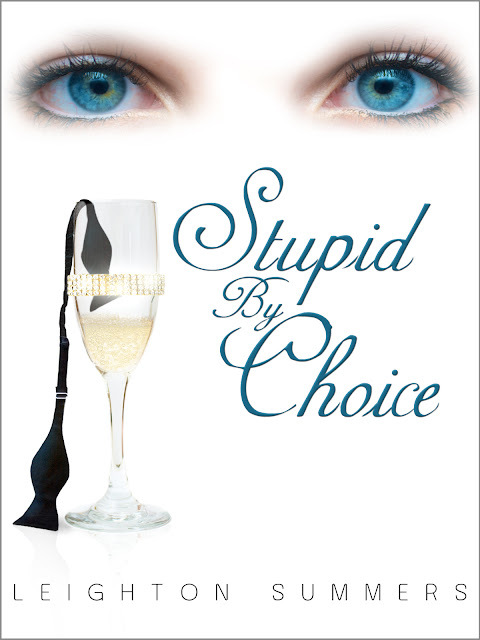 ​In STUPID BY CHOICE, this summer’s must-have beach read from author Leighton Summers, we follow the fictional and fabulous Melanie as she attempts to find true, lasting love amongst the wealthy, jet-set, spoiled, sought-after playboys in the elite social circles of Texas, Monte Carol, Manhattan, Newport, and Palm Beach. Facing one destructive love affair after another, as well as financial troubles, family drama, unplanned pregnancy, and more, Melanie and her friends traipse through the high high’s and low low’s of elite society, all while negotiating the blows they’re dealt with vulnerability, extravagance, and a resilience that every woman, regardless of social strata, will recognize as her own. Don’t mess with Texas! An insider’s look—good and bad—at what socialite American society life is really like from a Texans’ P.O.V. The ‘problem-free’ lifestyles of the rich and well groomed: does money solve as many issues as one might think? Or does it just create more? Finding courage in the face of the unknown, taking risks, and following your heart! 1. Do be educated. Most wealthy men like to marry a woman with a degree, so go to college. I was lucky, for my family had the money to send me, my sister, and even Emily to college. (The typical student loans can take forever to pay off, and Oldie didn’t want any of us to have to start our adult lives doing that.) Oldie always said having money to pay for your children’s educational needs is VERY important to consider to give them a great start in life, and I knew just what he meant when I had to find a way to take care of Blakely’s education myself while I was a single mother. Be sure you are thinking of how you will pay for your children’s education when dating anyone, and make sure you also have a great education yourself before you even have children. You will be proud of that accomplishment as well as impress anyone you date if you are well educated. 2. Do enjoy traveling. Most men of means like to live the “jet-set” lifestyle, so be sure you like to experience new places—and often. You can see the world when you have the money to do so, and trust me, traveling to places like Europe and Mexico are memories you will NEVER forget. Traveling also affects your life experience greatly in many different ways. For example, if you were given the chance to go to Africa you would see the suffering and pain in the children's eyes from living in this harsh, third world condition. But you would also see that they are some of the kindest, sweetest, and most appreciative people anywhere in the world as well. You are changed forever after you travel to places like that and it really helps you grow as a human being. And yes, getting to spend the entire summer in the South of France or in Newport, R.I. is also pretty great! Both are like “La La Land” and it feels like you are “escaping” to paradise while you are there having nothing but fun. If you want to date a rich man, just be willing to always have your bags packed and your passport ready, for you will most likely travel a lot. 4. Do appreciate fine jewelry. “Diamonds really are a girl’s best friend” in the upscale socialites’ world, and shopping when you have no budget is really, really fun! Whether dating or married to a wealthy man develop a taste for fine jewelry and know the difference between gemstone cuts. You will be sure to create a wonderful collection over time that way! 5. Do let the man you are with know you appreciate the financial security he offers you. This is mostly for after you say “I do,” but you will have no worries about “when or if” the next check is coming in to pay the bills if you are living with or married to a wealthy man, for you know the bills are always taken care of (and normally by an accountant, not even either of you). I think this is the main reason most women seek out a wealthy man, for having financial security is important in life, but still be sure you love him and aren’t just using him for his money as the case was with both Emily and Eva. That never ends well, for anyone involved, and no one ever likes being used for any reason. Just be sure it’s really love and let him know you are grateful for the lifestyle you have with him. You will always have both happiness and financial security that way. 1. Don’t use caretaking as a “disguise” for love or friendship. You should not start dating (let alone marry) someone much, much older than you who is sick or close to the end of their life, for it never works out to be a happy marriage. I have seen it, and what always ends up happening is YOU become the “nurse” to him, not a real wife, and it is a drag, for everyone. 2. Don’t ever let yourself “go”. You always have to look great or the men in these types of upscale social circles will lose interest fast. Yes, your hair, nails, make-up, clothes, shoes, and even year-round “tan” are a lot of maintenance to keep up on an on-going basis, but if you don’t, you will not attract most, if any, wealthy men. They like to have someone attractive and fit by their side, so be willing to always look your best. 3. Don’t stay home from a trip. As I said as a “do,” like to travel—and often—for if you don’t and stay home most men of means will still go away without you, often meeting someone else when they arrive to take your place (if only for that weekend). Always travel everywhere together, for this is the best way to try to keep him (and maybe even you) faithful to each other. 4. Don’t EVER put up with an abusive relationship, in any way. This is a lesson I want every reader of my story to walk away with… for it’s NEVER worth it to let someone hurt you in any way, ever, or even try to control you. (And remember, verbal abuse is abuse, period. Words can hurt just as badly as getting hit, even though that is also something no one should ever endure.) No amount of money in the world can make up for putting up with any form of abuse, so if you are with a man—wealthy or not—who is hurting you, end the relationship now. 5. Don’t ever use (or marry) anyone for their money, and don’t be deceived or influenced by the appearance of someone else’s wealth (for it might not even be real anyway). As I already stated, no one likes being used, ever, yet unfortunately it happens all the time (and especially in upscale social circles, to both men and women of means). Emily dates an overweight man she isn’t even attracted to just because he has money and ends up in a long-term relationship with another, wealthy alcoholic man who won’t marry her and just keeps “partying” with her (both of them actually “using” each other for years). No amount of money is worth doing that for a lifetime. Be sure you’re with someone for the right reasons, which is always for love and friendship, period, not their money. Leighton Summers is a sixth generation Texan who has traveled extensively throughout the U.S. and Europe throughout her whole life. During her travels, she was always surrounded by interesting, successful (and often eccentric) people who encouraged her to find her passion and live life to the fullest. Writing novels always intrigued her, and so one day while in New York City she took out her laptop in a café and decided to jot down some notes about how a female character, created from her own world, could “love smarter.” Over the next four years, those notes turned into both funny and sad adventures of a woman’s quest to find friendship, love, self, and family and became Stupid By Choice, Summers’ debut novel. Thanks for the giveaway. Not sure about the girl crush question. Sorry. 'Don't ever let yourself go'. Thank you for the giveaway. "Don't ever let yourself go." I agree with this one. Thank you for the giveaway & being part of this hop! "Do appreciate fine jewelry" ...too funny! Thanks! #4 in the Don'ts. Abuse should never be tolerated. Get out - now!! Don't ever put up with an abusive relationship, in any way...couldn't agree more! #4 is the one I agree with. Strongly agree with #4, its not always easy to notice or be aware of abusive relationships particularly when its mental rather than physical and I wouldn't wish it on anyone.